If you have a desire to become an entrepreneur, you can choose a suitable and comfortable side business as a full-time job. A side business will help you become economically self-employed. Currently, there are many types of side businesses that you can easily start by investing a little bit of capital. A right decision of side business can lead you in the workplace. With the help of your talent on the part-time business, you can take all the work forward. You can quickly start a Business with the advice of skilled and expert. If you wish, you can start a business with Partners. If you start with a trusted partner, you can lose a lot of pressure. Necessary equipment and manpower are needed to start this business. 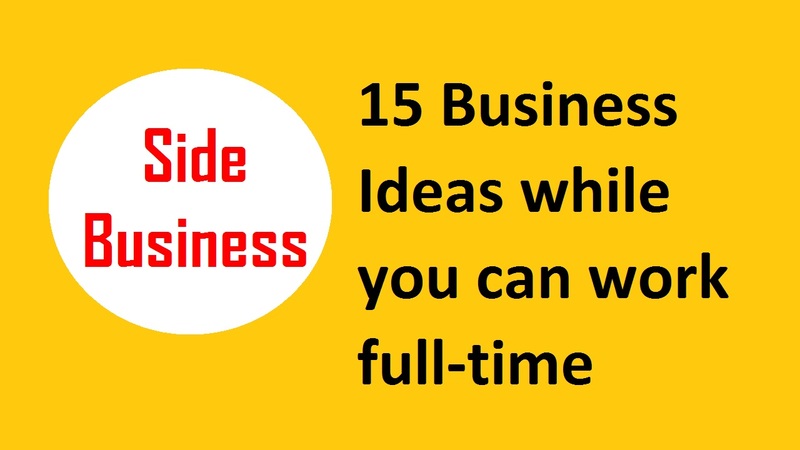 I will discuss 15 side businesses that may be favorable to you. The most important tips to start any business is a great business plan. So before you start you have to know how to make a business plan and implement the plan. Increasingly, the demand for graphics design continues to grow. Basically, a graphic designer works like photo editing, make posters, banners, visiting cards etc. Knowing about the use of software like Adobe Illustrator, you can easily start your Side Business as a Graphics Designer. Web design is a top side hustle business idea. Web design is a great and quality oriented art which is creating by using a websites or apps with the light of experience. To be a web designer, learn about the work of HTML, WordPress, CSS etc. You can open an Instagram account and start marketing your product or brand. To start Instagram marketing, you have the right marketing skills. You can earn a lot of money if you start working as a freelance writer. You can choose as a great way to earn money by dedicating yourself to an established blogging site. You can start freelance writing by creating profiles on sites like balancer, upwork etc. Basically, Amazon reselling is a home-based side business ideas where you can work in full-time. Anyone can sell goods if he wishes in Amazon. If you have a product that is suitable for sale or you have extra products left after doing any work then you can easily resell here. From here, buying the products at a lower price can be resold at a higher price again. Basically, affiliate sales and marketing is a website based business idea. This is a great way to earn money. Affiliate marketing allows you to earn money by marketing of the created products. ShareAsale, Rakuten, Clickbank, Skimlink etc. is currently the most popular affiliate marketing sites. In these sites, you can also affiliate yourself in marketing by advertising. This is a complete home-based side business idea that can be self-reliant by you. You can start working as a social media manager by using your skills and experience. Without making any unnecessary time on popular social media site like Facebook, Twitter, Whatsapp etc. you can build on the site as a side business, as one of the ways of income. It serves as a very promising campaign for most of the companies, new businessmen, and wholesalers to promote their business. This is one of the most common means for customers to use social media to familiarize themselves with their brands in online. You can get a lot of work on sites such as Flexjob and Careerbuilder etc. A property manager is essential to real estate investors. In this case, you have to take care of a large apartment, building or land. This could be one of the mediums of your income. In this case, you have to do repairs, collect rent checks, emergency calls and improvements etc. Fiverr is a popular site for freelancers to make income. You can start working on this site as a Side Business. You can easily start the income from Fiverr by doing logo design, make animation etc. It is the best platform to make money. The art collector is a very popular business sector. It requires time, patience and dedicated mind to get started. If you are interested in this industry, you can get an idea of collecting art from a local education institute or an old archive. Later, you can manage the business by selling it to different art companies and amateur art collectors. Data Analysis is a popular freelancing medium. Due to the fact that Data Analysis is a very easy and attractive sector, it is becoming a trusted income method for everyone day by day. Upwork, Digiserved etc. are the best data analysis sites now. These sites are easy to find work and earn a lot of money. Tour is a wonderful experience for all the people around the world. By using this opportunity you can become a tourist guide. Today it is a very challenging and popular business medium. If you know the best of any tourist place near you, you can easily become a local tourist guide. Good communication skills are must be needed to start as a Tourist guide. If you have expertise in two or more languages, then you can also easily take the translator profession as a side business. The skill of grammar and spellchecking will play a significant role in improving the business in this sector. Flex job is a great site for translators, you can easily earn money here. This is one of the key branches of side business. The efficiency of running your computer will help you to progress your business better. This business can easily be done for you in a small extent .It’s very likelihood side business sector for young and new entrepreneurs. Customer Service is a progressive business sector, through which you can get a smart way to earn a living at home. For any customer service company, you can easily run this business at home. Your main job is to provide customer service, upcoming phones and live chats for a part-time. It can be a challenging business sector for young entrepreneurs.